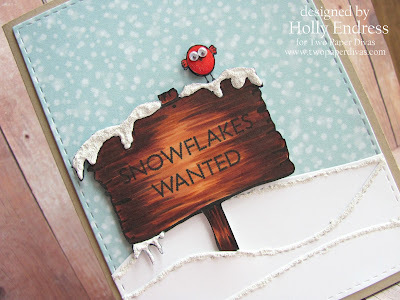 Hollybeary Creations : Snowflakes Wanted!! No snowflakes here please though.. Ha Ha Happy Friday or Halloween eve everyone. I hope you are ready for a great weekend. 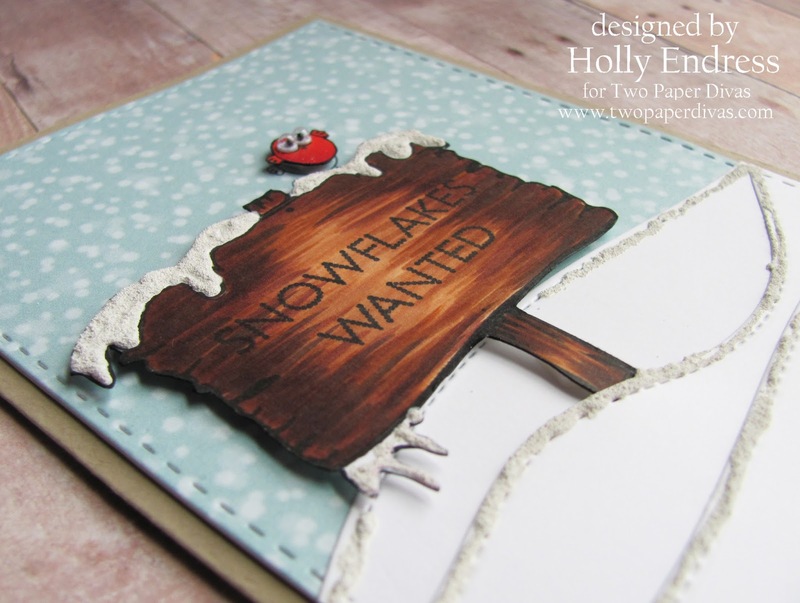 Today I have a fun card featuring the Two Paper Divas set Winter Welcome. Once I had the card done I felt like it needed something else but nothing was looking right so I rolled with it as is.. lol I created a Kraft standard A2 size card base and I added a piece of Let's Bokeh in the Snow 6x6 paper from Lawn Fawn that I die cut with a rectangle die from YNS. I created some snow banks with the stitched hillside boarders from Lawn Fawn. I stamped the bird, sign with sentiment images onto a piece of white cardstock and colored them in with Copics and then I cut them out. I used Copics E33, E37, E29 & E49 for the sign. You want to leave some white in the center and a few thin white spaces while coloring in with E33 as your base. Then working from the outside in flick the shades into the center area. Use E49 sparingly at the end in just a few areas and don't blend. I added the sign & bird to the card base with some dimensional adhesive. I added the legs for the bird with a Copic multi-liner. For the snowy texture I added some snow with the Deco Arts Snow writer. I followed along the stitched edges and then filled in the area on the sign image and I let it dry overnight. And I added a few googly eyes to the bird.. so cute! This is the first time I've used this product and I won't use it again. It was thick, gooey and got everywhere. When I opened it as I was removing the foil it started coming out on it's own and was everywhere. You had to really squeeze hard to get it out of the applicator as I was using it. It was flaky as it dried and it got everywhere.. it was like having white sticky sand on your hands and your desk. Anyways.. this does give a great snow effect and texture. It didn't flake off once dry.. but the cap is clogged and I used it once. You could achieve this same effect but putting down a thick layer of Glossy accents and sprinkling some white embossing powder onto it and letting it dry overnight then shaking off the excess. It would be a course texture similar to this. 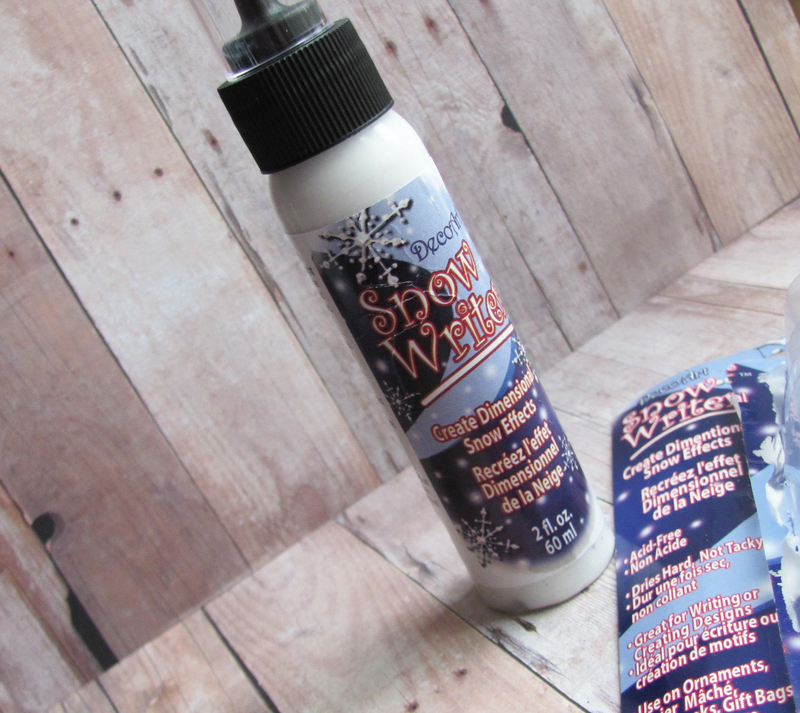 There is also several other products on the marker that make a snow effect.. I will use a few in the coming weeks to show you the difference. This is just my opinion on this stuff.. I'd recommend Liquid Applique' and a heat tool for snow. Head over to the Two Paper Divas blog for more great inspiration.. Have a great weekend!! Awe this is Adorable! !!!! Adorable card....turned out great just the way it is!